The thing about poetry readings is they are really bits of theater in small. Both audience and authors are staged, the verbal costumes (forms!) are shown off, and with a bit of luck everyone suspends their disbelief about the power of poetry in order to be moved. It doesn’t always work, but when it does, the effect can be spellbinding. An excellent poetry reading can leave you lying awake in bed, attempting to recall certain lines or titles, as you would the name of some handsome stranger who just bought you a drink. And the whole business is great for the authors as well, who in fits of method acting get to act like poets. Though it may seem, with my tongue firmly embedded in my cheek, like I am speaking about a kind artifice, I really mean embodied imagination. The poem made visual art via the poet’s body and voice. 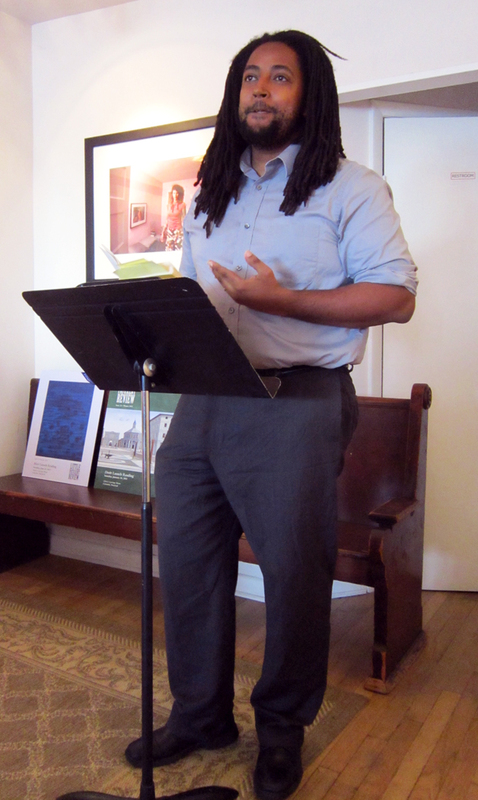 In that mode it seems fitting that Little Patuxent Review partnering with The Town Square Reading Series chose to celebrate its Music themed summer issue last Sunday, August 18th, at Baltimore’s Minas Gallery. And as luck would have it, I was asked to be one of the featured actors/readers. What’s fun about Minas Gallery as a literary venue is being surrounded by beautiful art in an intimate yet public space. The vintage clothing store on the first floor works like a quirky foyer for the art gallery on the second floor, where the readings are held. For this reading, instead of paintings, photographs lined the walls. Portraits to be precise. Strange portraits. Plenty of blue-hairs, and I don’t mean older women, and one man with stag antlers. The pieces were lovely, really, and made for an interesting backdrop for the poems, as well as the imagined sense of a larger audience. In terms of actual people, the place was packed, every seat filled, with a few folks standing in the back. Why is it that the “Poetry is dead,” statistics-mad, naysayers can never seem to “quantify” the actual bodies that continue to go to poetry readings? 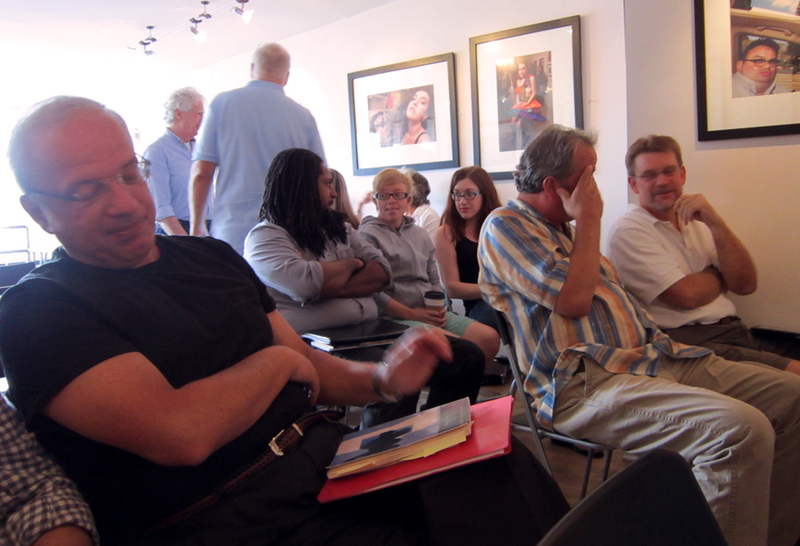 Minas Gallery packed for poetry. As a biracial, African American poet I am used to living as a critique and tend take note of audience diversity, inevitably wondering, “Am I the darkest person in the room? The youngest? The only one in a interracial relationship?” What can I say? I like a little meter, a little iamb in my audience. 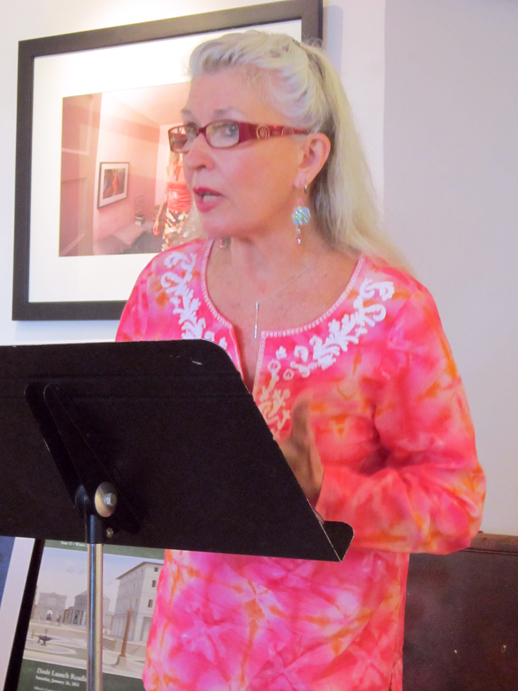 I was not disappointed, and I think that speaks to the strength of LPR as well as The Town Square Reading Series, and The Free State Review whose editors and contributors were in attendance, participating in the open mic. All and all the reading was well set. The poets just had to fill the space with music. I was fortunate to read with such Maryland mainstays as Michael Salcman and Clarinda Harris. One lovely aspect of being a part of a group of featured readers is entering in to that reciprocal space where poems from separate poets seem to act like point and counterpoint, melody and countermelody. Correspondence in air as the poet Ilya Kaminsky calls it. Each of the readers acts as both reader and audience, both costumed monarch and Greek chorus, which is humbling, healthy, and awe inspiring. I believe all of the featured authors would argue for the importance of listening to a poem for what it wants, listening to others by reading, and listening to the imagination, therefore how much more important is it for the same authors to model listening and demonstrate how poets are able to riff off each other in the moment. It reminds me of that old adage, “Acting is reacting.” Poets can and do make use of the sensibility as well. So the Zydeco of my poems talking back to the twelve bar blues in Clarinda Harris’ work, while Michael Salcman’s poem about Bach as fat man sustained like a bass note, created an atmosphere for living verse. But that dialogue wasn’t insular; it didn’t exclude the audience. A joke I made about wanting to be an actor when I was young and realizing that my son (2 years old) is handsome enough to be one, sparked a conversation post reading with audience member about ancestry and striking features. One of the open mic readers mentioned that he was a geologist and said he really enjoyed my poems about place. Can a geologist give a higher compliment to a poet? Other people were enthusiastically chatting about setting poems to music, former poet-teachers, and a whole host of other topics. In Skin, Inc. Thomas Sayers Ellis suggests that a line breaks multiple times before the final break on the page when written and then voiced by what he calls perform-a-formers. In other words, excellent poets. What I find interesting is seeing the embodiment of those multiple breaks in the proliferation of active, creative conversations after a reading. Conversations about everything that is alive, even grief. Lines were certainly multi-broken at this reading. With a bit of “theater” in verse on a Sunday evening in Baltimore, above a vintage clothing store, framed by quirky portraits, with a metrical audience and a few perform-a-formers, collectively another reason was fashioned to transcend our disbelief in the power of poetry. Hopefully in the aftermath author and audience alike encountered in their sleep the name of a handsome stranger buying drinks folded with half remembered lines of poems. Steven noted the distinct possibility for poets riffing (to borrow a musical term) at readings, finding inspiration from each other in the moment. An interesting contrast is found in Social Justice issue guest editor, Truth Thomas’, account of the differences between the solitary and collaborative nature of music and poetry. Steven Leyva teaches writing at University of Baltimore and is the recipient of Cobalt Review Poetry Prize. His poems have additionally appeared in Welter and The Light Ekphrastic, and he has published a collection entitled Low Parish. 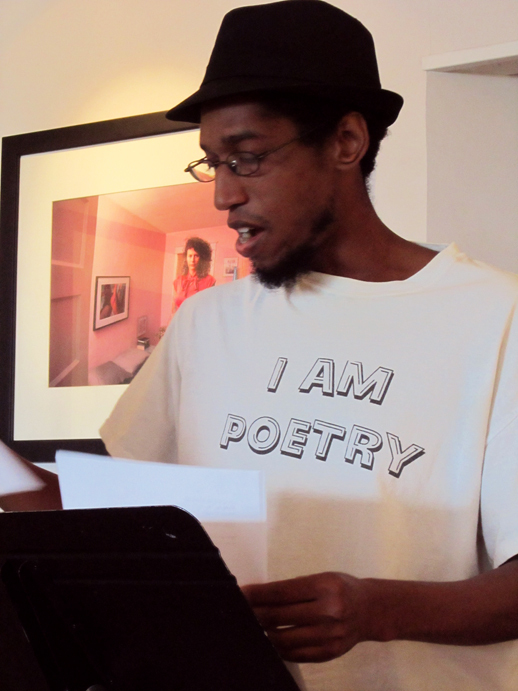 He is the co-creator of the poetry reading series, Kick Assonance. This entry was posted in Poetry and tagged acting, Michael Salcman, Minas Gallery, Poetry reading, Steven Leyva, Town Square. Bookmark the permalink. Music to my eyes, this essay, like unto the Minas reading itself which was music to both eyes AND ears! Welcome, Steven: You area alrady proving the cosntancy (in the Renaissance sense of “devotion”) of change.